The canvas was up and the runners were down again today. More than 30 ice yachts gathered on the Hudson River, almost certainly the last day of the season. I set up my sketching stool in the midst of it all and tried to capture the scene in gouache. The Vixen, which gave me a ride last Sunday, is at the far right, and the gaff-rigged vessel at center is the Genevieve. These are the classic stern steerers, restored by loving craftspeople who are reviving this popular sport that had its heyday more than a hundred years ago. 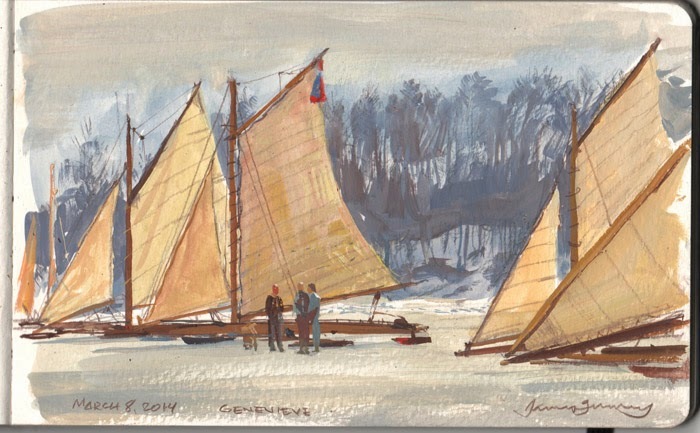 The oldest iceboat out there today was from about 1870, and most were from around 1900. That is so cool! Thanks for posting this, I had never heard of these things and I'm so glad to see it! Wow! Thanks for taking part and creating a record. I have never seen so much activity on the river before. Maybe in the 70's... but nothing like this. Maybe a hundred years from now people will see your paintings and think every winter was like that ( like the Hyde Park post office sturgeon mural ) Great stuff! I have never seen anything like these. I know about sand yachts but ice yachts, crazy !. How do you tack or gybe them. Wonderful. Bernard, I asked the skippers about this, too. Because they have so little drag and side slippage, they can sail very close to the wind, and tack upwind on points of sail unknown to water sailers. Jibing is no problem because they're often going faster than the wind.